The nursery is a purpose built self contained unit is the grounds of Hillsborough Campus. It is a 53 place nursery offering care for children from six months to 8 years. Opening times are Monday to Friday 8.00 am - 6pm, 50 weeks per year. We offer care for children of students, staff and the wider community and are accessible to ALL. During the school holidays we can also take school children up to 7 years old. We plan lots of different activities during this time, including arts and crafts and outings. Healthy snacks are provided mid morning and mid afternoon, parents can either provide a healthy packed lunch or purchase a nutritious hot lunch. Children learn best when they are healthy, safe and secure. Our stable staff team work closely with parents and other professionals to ensure that children and families receive a high quality professional service tailored to individual needs. Our home and nursery links include a take home bear which children take to visit their home taking photos and recording her adventures. We also have a children’s library. All children are allocated a key person who works with our Early Years Professional to develop and record their individual learning and progress through the Early Years Foundation Stage. We believe it is important to be spontaneous and have fun with the children and also to plan for specific experiences, opportunities and activities to meet children’s individual’s needs and interests. "The quality of teaching throughout the nursery is excellent. Staff are highly skilled practitioners who help children to thoroughly enjoy learning opportunities." "Staff are well qualified and very well experienced. They demonstrate an excellent knowledge and understanding of how children learn. A wide range of teaching strategies are used to ensure all children make very good progress based on their starting points." The full report can be viewed on the Ofsted website here. From the north by car: Leave the M1 at J36, follow the A61 towards Sheffield for 5 miles. On your left, you will pass Hillsborough Leisure Centre and soon approach traffic lights opposite Pizza Hut. Turn left at the lights and follow the road past Owlerton Stadium. Hillsborough Campus is on your right. From the south by car: Leave the M1 at J34 (Meadowhall). Follow signs for Hillsborough/Sheffield Wednesday. At the junction opposite the football ground, turn left onto the A61 (Penistone Road) towards the city centre. On your left, you will pass Hillsborough Leisure Centre. 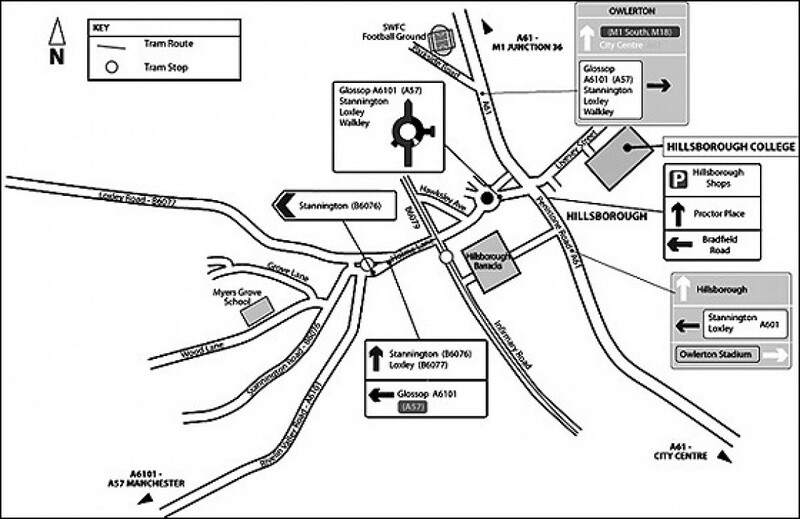 At the traffic lights opposite Pizza Hut, turn left, go past Owlerton Stadium and Hillsborough Campus is on your right. Alternatively, leave the M1 at J33 (Catcliffe) and on to the Parkway towards the city centre until you reach traffic lights. Enter the right-hand lane and continue onto Derek Dooley Way/Outer Ring Road, following the signs to Hillsborough/Barnsley. At the traffic lights at Morrisons, turn right, go past Owlerton Stadium and Hillsborough Campus is on your right. The nearest tram stop is: Hillsborough and Hillsborough Park. Each are about a 5 minute walk away from Hillsborough Campus. For live updates for bus and tram times click here or go to Travel South Yorkshire for timetables and fares, and the Supertram website for tram information.